It’s the rainy season once again! For runners who don’t like to get wet, it’s indeed a challenge how to continue running during these wet months. I, too, don’t like to get my sneakers wet, but when I trained for a race, I ran as scheduled, rain or shine. Run early in the morning. You can go straight to the shower after your run. Wear a hat to keep the rain off your face. There’s nothing more annoying than to keep on wiping your face just to see where you’re going! Don’t wear a jacket or hoodie. It will just slow you down and you’ll still get wet anyway. Use Vibram FiveFingers. Unlike running shoes, it won’t feel as squishy when it gets wet. As always, bring some identification. If you don’t have a RoadID, a simple ID will do, just wrap it in a small ziplock bag. If you really don’t want to get wet, opt to do some speedwork in an indoor track instead. You’ll keep out of the rain but still get the workout you need. When you get back from your run in the rain, put some old newspapers inside your shoes to draw the moisture away. Hang them up to dry. What about you? Do you like running in the rain? 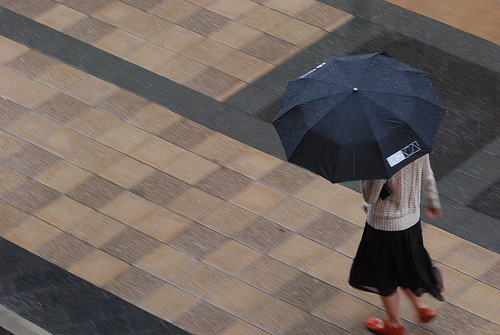 Do share some of your rainy day tips with us! This Morning, I actually did some speed work on outside track in light rain and it was awesome. Tips? just plow on if it&#39;s not too bad or hailing of course. Then you would want to wear a helmet of some sorts. To get use to running in the rain, you can try running in place in the shower. Take care. I&#39;m really not a fan of running in the rain. @ Kenley, I agree it&#39;s nice to run in light rain sometimes. You get so refreshed, right? Have you ever tried running in the shower? It seems weird. hehe<br /><br />@ Nick: Sometimes I don&#39;t have a choice. In the Phils it&#39;s always raining from June onwards. We just have to get used to it 🙂 Thanks for dropping by!